As a result of expensive long-term contracts to veteran stalwarts, the Anaheim Ducks are a team that needs to focus on winning now. Ryan Getzlaf, Corey Perry, and Ryan Kesler are all locked up through at least 2020-21 (2021-22 for Kesler) at a total annual average value (AAV) of $23.75 million. 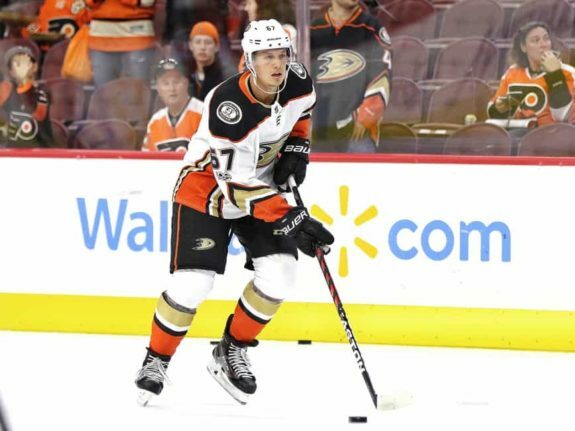 While those deals might not look so great in the not-so-distant future, one contract that is paying and will continue to pay enormous dividends for the Ducks in the long-term is the one to forward Rickard Rakell. At age 24, Rakell is in the early prime of his career and has a number of good years left. Anaheim has him under contract for those years, as he is signed through 2021-22 at an incredible AAV of just $3.79 million. Prior to the 2016-17 season, Rakell and Hampus Lindholm were both restricted free agents, and with the Ducks in a tight salary-cap position at the time, deals for each took longer than anyone (besides other teams) probably would have liked. In Rakell’s case, rehabilitation from abdominal surgery and a bout with a rough stomach virus impeded contract negotiations, but the deal eventually got done right after last year’s regular season commenced. At the time, Rakell was 23 years old and coming off his first 20-goal season. General manager Bob Murray was able to get his rising Swedish star to commit to six more years at the aforementioned AAV of $3.79 million. Murray and the Ducks struck the perfect deal in paying not so much for what Rakell had done but for what he and the organization projected he would do in the following years. An AAV of almost $4 million might have seemed a bit high at that point in time, as Rakell had never even hit the 10-goal plateau before 2015-16, but Murray knew the payoff would be good if Rakell continued to develop well. Even so, Rakell’s ascension to a consistent 30-goal scorer and a go-to offensive player for the Ducks might even be better than the development for which the organization had hoped. He has continued to improve and increase his production, culminating to this point in a season that has seen him earn his first All-Star Game appearance. Even if Rakell’s production were to plateau from here on out, he would still be giving the Ducks a huge return on their investment in him. Rakell, a first-round pick (30th overall) of Anaheim in 2011, saw a handful of games in the 2012-13 and 2013-14 seasons, only picking up four assists in 22 regular-season contests across the two campaigns. He gained a full-time role in 2014-15 and posted a respectable 31 points (9 goals and 22 assists) in 71 games. He also scored an overtime goal in Game 3 of an eventual sweep of the Winnipeg Jets in the first round of the playoffs that season. The Swedish forward became more of an offensive force in 2015-16, when he scored 43 points (20 goals and 23 assists) in 72 contests. Then, in 2016-17, playing his first year under his new long-term contract, Rakell showed his capabilities as a bonafide sniper, collecting 33 goals to lead the Ducks while adding 18 helpers. He was also a force in the postseason, as he found the back of the net seven times to go along with six assists. His breakout season in 2016-17 seemed like it might be difficult to improve upon or even replicate. After all, his shooting percentage was an astounding 18.6 percent. Could he keep that up? Pretty much. Through 64 games, Rakell has already hit the 30-goal mark once again while shooting at a 16-percent clip. He also has 29 assists to give him 59 points, already well ahead of last season’s career-high total of 51. Some might argue that a big reason for Rakell’s success is the playing time he gets on the wing of playmaker-extraordinaire Ryan Getzlaf. They wouldn’t necessarily be wrong, as the duo’s chemistry has been dynamite, so much so that the Rakell-Getzlaf combination has, in reality, surpassed the long-renowned duo of Getzlaf and Corey Perry. Indeed, Getzlaf assisted on 13 of Rakell’s 33 tallies last season. This season, since Getzlaf has missed a large chunk of the season due to injury, there are reasonably robust sample sizes for games Rakell has played both with and without Getzlaf in the lineup. That split draws some interesting takeaways regarding Rakell’s play—the bottom line being that Rakell is a versatile player who can hold his own even without playing on the wing of an elite center. Rakell has played 44 games this season with Getzlaf in the lineup, spending most of his time in those contests on Getzlaf’s wing. In those games, Rakell has notched a whopping 25 goals and added 17 assists. That ratio looks a bit closer to last year’s 33/18 mark and illustrates that Rakell serves as a finisher and beneficiary of Getzlaf’s playmaking abilities. Rakell’s other 20 games have come without Getzlaf, and he has only scored five goals in that sample. However, he has assisted on 12 goals, giving him 17 points—not far off from a point-per-game average. With Getzlaf and others (e.g., center Ryan Kesler) out of the lineup earlier in the season, Rakell had to spend some time at his natural center position. The numbers suggest that his game is malleable, as he seemingly adjusted to that role by becoming more of a distributor than a finisher. This not only demonstrates Rakell’s wide-ranging skill set; it also bodes well for the future, as Rakell might very well return to center down the road, especially as Getzlaf and Kesler age and ultimately move on. For now, though, Getzlaf is still producing at an eye-popping clip, and the Ducks have a half-new dynamic duo that’s working for them. Rakell will not even be 25 years old until May, and he is already a borderline elite player. He has scored at least 30 goals in consecutive seasons and has become almost a point-per-game player, with 59 in 64 games. He has caught fire recently, tallying eight goals and three assists in his past six games. As Rakell kicks things up a notch to try to help will the Ducks into the playoffs, it’s also exciting for fans to know that Anaheim probably has many more years of top-flight production from him—four of which will come at an absolute bargain against the salary cap.